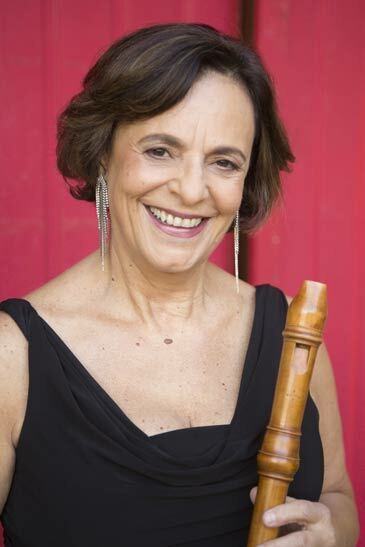 Brazilian recorder player Cléa Galhano is an internationally renowned performer of early, contemporary and Brazilian music. Galhano has performed in the United States, Canada, South America and Europe as a chamber musician, collaborating with recorder player Marion Verbruggen, Jacques Ogg, Belladonna, Lanzelotte/Galhano Duo and Kingsbery Ensemble. As a featured soloist, Galhano has worked with the Saint Paul Chamber Orchestra, New World Symphony, Musical Offering and Lyra Baroque Orchestra. Among other important music festivals, Ms. Galhano has performed at the Boston Early Music Festival, the Tage Alter Music Festival in Germany and at Wigmore Hall in London, Weill Hall at Carnegie Hall and Merkin Hall in New York and Palazzo Santa Croce in Rome, always receiving acclaimed reviews. Ms. Galhano was featured in 2006 in the Second International Recorder Congress in Leiden, Holland in 2007 and 2013 at the International Recorder Conference in Montréal and in 2012 at the ARS International Conference, Portland, Oregon. She gave her Weill Hall at Carnegie Hall debut in May 2010 and her second Weil Hall recital on December 2013 with the international Cuban guitarist Rene Izquierdo. Galhano studied in Brazil at Faculdade Santa Marcelina, the Royal Conservatory in The Hague, and the New England Conservatory of Music in Boston, earning a LASPAU, Fulbright Scholarship and support from the Dutch government. As an advocate of recorder music and educational initiatives, she served for six years on the national board of the American Recorder Society, and is the Music Director of the Recorder Orchestra of the Midwest. Ms. Galhano recently received the prestigious 2013 McKnight fellowship award, MSAB Cultural collaborative and MSAB Arts Initiative. Currently, she is the Executive Artistic Director of the St. Paul Conservatory of Music and a faculty member at Macalester College, Music Director of the Recorder Orchestra of the Midwest, and has recently been appointed Adjunct Lecturer in Music, Recorder at HPI, Jacobs School of Music, Indiana University. Ms. Galhano has recordings available on Dorian, Ten Thousand Lakes and Eldorado label and she is the recipient of the National Arts Associate of Sigma Alpha Iota. Cléa has been teaching at the PTEMW since 1997. We can’t imagine this workshop without her sparkling personality and limitless energy. “I consider it a privilege to play under Cléa’s direction”. This class will focus on vocal and instrumental music from the Renaissance repertory from Portugal to colonial Brazil. Works by Pedro Escobar, Bartolomeo Trosylho, Gregorio de Matos, Padre Jose Maurico Nunes Garcia and others. Music in Brazil has been influenced by many different things and people all over the world, while influencing other culture’s music along the way. Although numerous cultures have fed into the mainstream music of Brazil, there are three main cultures that have been of important influence. In this class we will work on the different styles of Brazilian music that represents all the influences from Africa, Portugal and France.